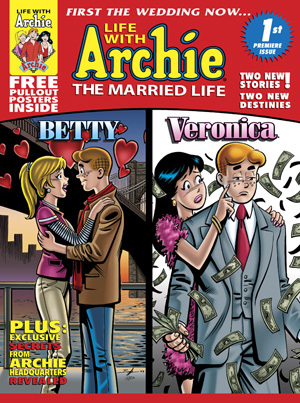 Due to the vast amount of positive responses to the two new titles, “Archie Loves Betty” and “Archie Loves Veronica” — previously announced for release in standard comic book format — are being brought together into a more widely available format. The more mainstream platform of a magazine will enable greater accessibility of the already hugely popular ongoing series to a growing number of fans all over the world. The larger format of the magazine will allow room for more vivid artwork and a more accurate reproduction of that art with higher quality paper and printing. Well, that’s a move I didn’t expect. If they want to build audience, they’ve got to do a format that gets out of the comic ghetto, now that there aren’t spinner racks everywhere. And this means no choice for fans — which means no embarrassing moments if one title outsells the other — but since most wanted to read both anyway, that makes sense, too. However, will this be recognizable as truly a magazine, or is it just a thicker comic? And will comic shops buy a different format? It’s rare to see a publisher go back on a news story so quickly. I could be jaded and say this indicates a lack of follow-through or knowing what they’re doing, but I’m instead hoping that this demonstrates a company that’s interested in being more reactive to the market and ready to make needed changes for better outreach and flexibility. Now, if only they would tell us who’s writing and drawing these stories!